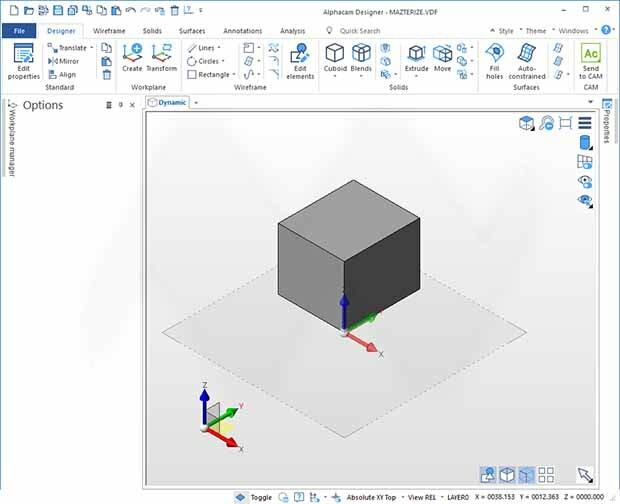 ALPHACAM Designer is a powerful CAD solution for taking geometry through to manufacture that enables users to create new designs or modify existing CAD systems. ALPHACAM represents the CAD framework that will become the core modelling engine for all CAM applications. It provides a quick, dynamic editing and complete modelling environment, that allows users to create and modify models (sketch, drag, hold, push, twist, etc.). ALPHACAM Designer 2020 is the ultimate solution for solids-based designs. It gives users the flexibility of receiving a CAD file from any source (supports native CAD systems). I works with data from almost any CAD supplier, it is working with complex designs and very large files can be handled with ease. You can transform existing 2D data of DXF and DWG files, into a 3D model by reusing profiles from the original data, automatically creating sketch profile regions. The program focuses on the needs of machinist programmers, providing specific CAD for CAM.